Civilization V puts history into perspective, all within its beautifully encapsulated experience. It perfectly captures the glee of discovering a new world, and the horrors of finding it already settled. It replicates the paranoia of being surrounded by strangers, and the thrill of conquering their lands. 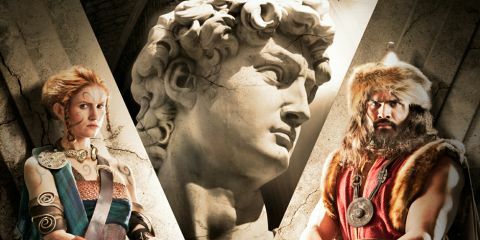 With Civilization V: Gods & Kings, Firaxis expands on the formula established with the 2010 release with a hefty helping of new additions, and while they don’t prove to reinvent the experience, they certainly give fans an excuse to start some new expeditions through history. Gods & Kings brings with it nine new playable civilizations, over two-dozen new units, and a slew of buildings and wonders. There’s also a completely new scenario called Empires of the Smoky Skies, which veers away from reality in favor of a Victorian-era steampunk future filled with airships and men in top hats. These additions are all wonderful, and flesh out the minute-to-minute gameplay with new options, but they’re completely eclipsed by the two largest bullet points on the box: the return of Religion and Espionage, both of which found homes in previous incarnations but were left out of the initial release of Civ V.
Religion finds its roots during the early years of founding a new society, allowing civilizations to specialize in faith – a new resource pool tied to many of the new abilities. After enough faith is gained you’re able to form a full-fledged religion, which comes with customizable bonuses to let you build the belief-system around your play style. Those looking to win a game through might can buff their holy warriors and purchase units with faith, whereas those interested in scientific or cultural victories can adapt their religion to those. But besides picking and choosing the passive buffs you want, you’re also able push your religion onto others with Great Prophets and Missionaries, who can be placed outside of cities to spread the good word. Cities, too, passively spread it themselves, creating “pressure” on nearby towns that slowly converts their people. This can have a nice domino effect, and there is some fun strategy to attempting to convert a rival’s people to your religion in hopes of being able to use your passive buffs against them.